Attacking women’s rights. Slamming the door on refugees. 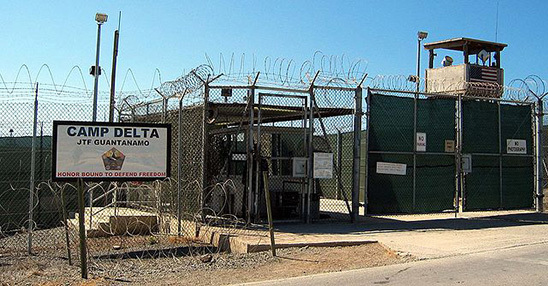 Keeping Guantánamo open. Tearing children from their parents’ arms. Quitting the UN Human Rights Council. Trump’s human rights record is truly terrifying. In this Human Rights Autopsy Report we dissect his most worrying policies to date, showing the damaging effect they are having across the globe. Trump has drastically stepped up the United States’ use of deadly force, including by drones, in the Middle East and Somalia. An estimated 36 drone strikes or special operations raids were approved by Trump in his first 45 days in office, with over 2,000 killed by drone strikes since January 2017. 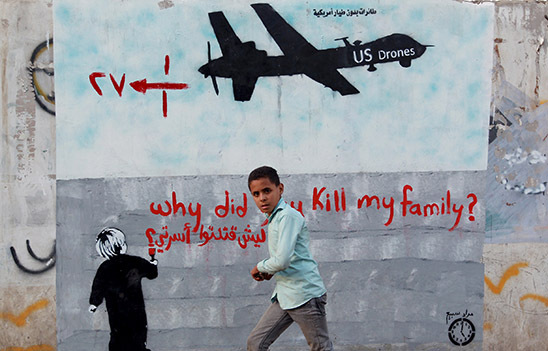 To make matters worse, it has been reported that President Trump has also rolled back the insufficient protections on the drone programme put in place by President Obama – so it’s possible these numbers will continue to grow at an alarming rate. What makes this worse is that the UK is helping it all happen. Take action to stop the UK assisting these secret strikes. Since the very early days of his campaign, President Trump has waged a legal, political and social war against refugees. One week into his presidency, Trump suspended the country’s entire refugee programme for 120 days, implemented an indefinite ban on Syrian refugees and slashed the total number of refugees that would be allowed into the country. This first ban was followed by two more refugee bans and successive policies targeting refugees. The United States is now seeing the least number of refugees resettled in decades. These bans and policies disproportionately affect Muslim refugees and are effectively dismantling the US refugee programme. 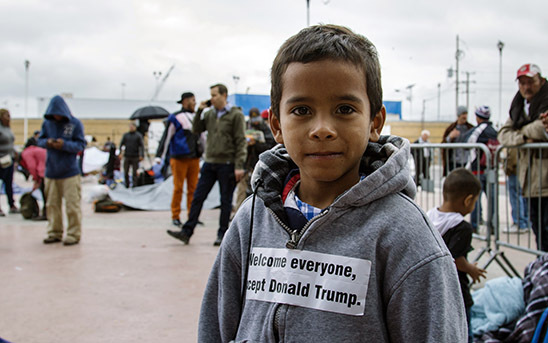 The global refugee crisis requires all countries, including the United States, to protect dignity and fairness, and reject fear and prejudice. Trump’s heartless policies have put thousands of people’s lives at risk. People like Sam – an Iraqi refugee stranded in Cairo, Egypt, after the U.S. government failed to keep its promise to resettle him. He has a sponsor in the United States waiting to give him a new home, but the U.S. won’t let him in. He is stranded in Egypt and at risk of being sent back to danger in Iraq. Trump’s vitriol against asylum-seekers has resulted in thousands of families being torn apart at the U.S./Mexico border and the threat of many more families being detained. Media have reported that in some cases, separated toddlers have had to represent themselves in court at their own immigration hearings. Even children with special needs weren’t spared, separated from their parents and cruelly denied their care. The public outcry to this horrific separation policy was huge, with the general public and Amnesty supporters around the world taking to the streets to pressure the Trump administration to bring families together. More than half a million Amnesty supporters have petitioned for asylum-seeking families to be released and reunited. Although Trump bowed to public pressure and signed an executive order on 20 June 2018 saying that families would not be forcibly separated, his executive order didn’t end the policy and didn’t order the re-unification of families. Instead, as his so-called solution, he ordered the mandatory detention of asylum-seeking families -- another human rights violation that cruelly punishes families who are seeking safety and security. Hundreds of families remain unjustly jailed. President Trump moved swiftly to ban the entry of anyone arriving from seven predominantly Muslim countries. 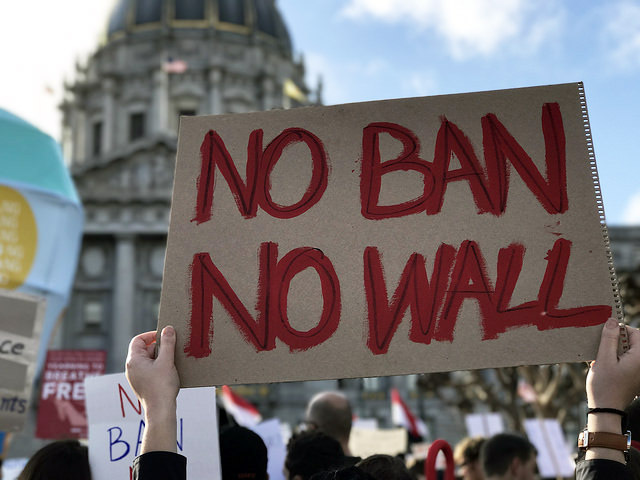 While the executive order did not explicitly mention a Muslim ban, the brazen religious discrimination was clear – especially in light of the President’s explicit call for a ‘total and complete shutdown of Muslims entering the United States’. With several versions of the ban blocked by lower courts, the US Supreme Court allowed a version on 26 June 2018 that targets travellers from Syria, Iran, Libya, Yemen and Somalia. It also includes limited sanctions against North Korea and Venezuela. This hateful policy is a catastrophe all around – not only for those who simply want to travel, work, or study in the States, but for those seeking safety from violence as well. After 16 years, the US detention camp at Guantánamo Bay remains a living symbol of torture and human rights abuses – a place of misery for over 700 Muslim men that were held there, and the 40 that remain. Whereas President Obama had vowed to close Guantánamo, Trump not only signed an executive order to keep it open in January 2018, he has also said he wants to expand it to hold more prisoners. Guantánamo was supposed to be a place for detaining extremely dangerous prisoners of war, but most of the inmates who ended up there were foot soldiers, or people handed over by warlords for a bounty. These men faced stark conditions and torturous interrogation techniques including extreme temperatures, excessive shackling, waterboarding and more. Now, they’re stuck there – including five prisoners who have for years been cleared to leave by all relevant U.S. national security agencies. The Trump administration has dismantled the infrastructure that was created to help send them home. An image of a group of men in suits standing around President Trump as he signed away the sexual and reproductive rights of millions of women and girls worldwide has become emblematic of the new administration’s danger to women’s rights. The executive order reintroducing and expanding the global 'gag rule' blocks US federal funding for overseas non-governmental organisations (NGOs) that so much as mention abortion in their policies – even though the USA does not fund these services directly. In Latin American and the Caribbean alone, where abortion is completely banned in seven countries even when the health or life of a woman depends on it, there is no doubt that Trump’s stance will cost many lives. Even in some countries where abortion is legal, clinics and hospitals will now have to choose between US funding that need use for things like maternal health or HIV/AIDS prevention or shutting down completely if they want to be able to provide basic information about safe abortion in their country to women who need it. Trump’s decision to advance the highly controversial Dakota Access Pipeline, a 1,200-mile crude oil route through four US states, put the profits of oil companies before the human rights of Indigenous Peoples. The Standing Rock Sioux Tribe, who have a sacred site near the route which bisects Indigenous land along the Missouri River, say the pipeline would contaminate drinking water and damage sacred burial sites. 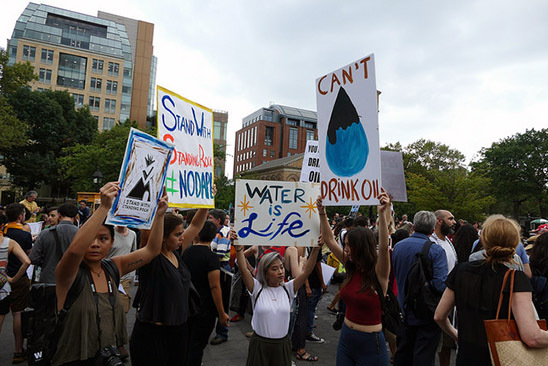 Not only was the pipeline construction approved in violation of the Native American group’s right to access clean water, the decision was also taken without consulting them and seeking their free, prior and informed consent – a requirement under international human rights standards. The arrests of dozens of anti-pipeline protesters came after police had already been accused of excessive force in their handling of previous demonstrations, heightening fears that environmental activists could now see their right to peaceful protest under greater threat. Join Trump Watch and stay up-to-date with all the work we're doing to fight back against the President't assault on human rights.